But what goes down can also rise again. And one of the most reliable ways of investing is to assume that prices will normally revert to their mean, or average. If this happens, rates have a long way to rise. Long-term UK interest rates since 1703 have averaged 4.5% through wars, booms and depressions. If we just look more recently, average UK 10-year rates over the past 25 years were 4.6%. We are clearly a very long way away from these levels today. “In total, the six central banks that have embarked on quantitative easing over the past decade — the US Federal Reserve, the European Central Bank, the Bank of Japan and the Bank of England, along with the Swiss and Swedish central banks — now hold more than $15tn of assets, according to analysis by the FT of IMF and central bank figures, more than four times the pre-crisis level. The key question is therefore ‘what happens next’? Will pension funds and other buyers step in to buy the same amount of bonds at the same price each month? The answer is almost certainly no. 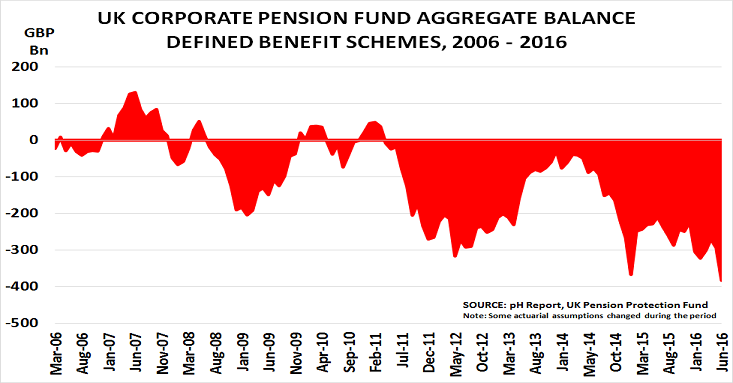 Pension funds are focused on paying pensions, not on supporting the national economy. And higher rates would really help them to reduce their current deficits. The current funding level for the top US S&P 1500 companies is just 82%, versus 97% in 2011. They really need bond prices to fall (bond prices move inversely to yields), and rates to rise back towards their average, in order to reduce their liabilities. Margin debt on the New York Stock Exchange (money borrowed to invest in shares) is now at an all time high in $2017. Ominously, company buy-backs of their shares have already begun to slow and are down $100bn in the past year. The Bank has therefore now imposed major new restrictions on lenders. They have ordered them to keep new loans at no more than 4.5x incomes for the vast majority of their borrowers. And lenders themselves are also starting to get worried as the average deposit is now close to £100k ($135k). Of course, London prices might stay high despite these new restrictions. Anything is possible. But fears over a hard Brexit have already led many banks, insurance companies and lawyers to start moving highly-paid people out of London, as the City risks losing its “passport” to service EU27 clients. Over 50% of surveyors report that London house prices are now falling, just as a glut of new homes comes to market. In the past month, asking prices have fallen by £300k in Kensington/Chelsea, and by £75k in Camden, as buyers disappear. The next question is how low could prices go if they return to the mean? 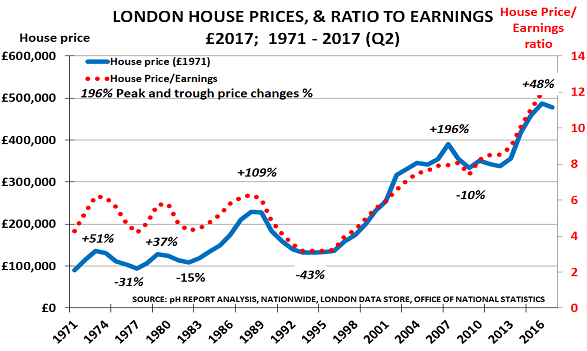 If London price/earning ratios fell back from today’s 12x ratio to the post-2000 average of 8.2x level, average prices would fall by nearly a third to £332k. If ratios returned to the pre-2000 level of 4.8x earnings, then prices would fall by 60% to £195k. Most Britons now expect a price crash within 5 years, and a quarter expect it by 2019. Brexit uncertainty, record high prices and vast overs-supply of new properties could be a toxic combination, perhaps even taking ratios below their average for a while – as happened in the early 1990s slump. As then, a crash might also take years to unwind, making life very difficult even for those who did not purchase when prices were at their peak. Markets have one main function in life – price discovery. If I want to buy, and you want to sell, the existence of a market allows us to discover the price at which the market will balance in terms of supply and demand. History, however, provides many examples of times when rulers decided they knew best, and destroyed market economics. The Soviet Union was one recent example, where the Central Committee of the Communist Party would decide what was going to be made and where, and the price at which it was being sold. That system of course collapsed with the Berlin Wall in 1989, but the collapse took decades to happen. Today, we have another central organisation which is attempting to carry out the same manoeuvre – the main central banks in the West. They have also destroyed price discovery by flooding markets with endless supplies of free cash. The evidence for this statement is in the 3 charts shown here. Normally, of course, this would mean that market prices also fell, as the outlook for earnings worsened. But the opposite has in fact happened, as the central banks have simply pumped out more and more free cash. 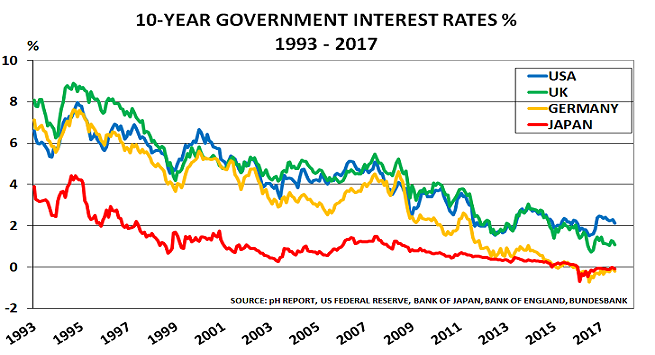 They have even taken interest rates to negative levels in many major markets such as Japan, Germany and the UK. Investors, increasingly desperate to try and meet their target returns for paying pensions etc, have responded by bidding up the price/earnings ratio from 18 a year ago to 49 today – easily the highest level ever seen in the period. This takes us to the 3rd chart, showing the IeC Boom/Gloom Index. It measures sentiment versus the US S&P 500 Index, and shows this has fallen back to danger levels once more. All the investors to whom I talk, recognise that the market is being completely rigged by the central banks. But, they say, “what can we do? We cannot go into cash, as it yields nothing, and benchmark Western government bonds also yield nothing”: $12tn of bonds even have negative yields. The fact that some of the best performing US$ debt markets in Q3 were El Salvador, Mongolia and Zambia highlights how desperate the “search for yield” has become. How long will the central banks be able to keep markets artificially high and defy economic reality? We cannot know. But we do know they are providing a fertile breeding ground for populist politicians, as I will discuss on Wednesday. It may be an idea to keep your smartphone charged and within reach, if you are planning a trip to the beach this month. Certainly market behaviour since June has been more and more skittish. 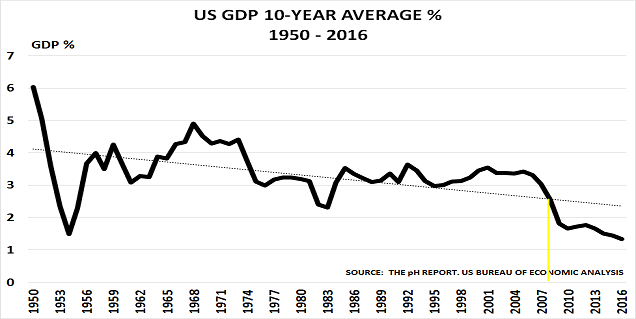 The experts, after all, were telling us that central banks were certain to do more major stimulus efforts to boost stock and commodity prices: they were also sure that the US economy was poised to do well. Instead, we have had minimal stimulus from the European Central Bank (ECB) and Bank of Japan (BoJ), whilst the US Federal Reserve was clearly taken by surprise with Friday’s weak GDP news for Q2. There was a similar state of confusion at the ECB last month, when markets were told to wait until after the holidays for any further stimulus. As always, the IeC Boom/Gloom Index is highlighting the potential turning point. Although the S&P 500 has recently made a new all-time high, the Index did not confirm the higher numbers. Instead, it has retreated to just above the 4.0 level which has signalled pullbacks in the past. 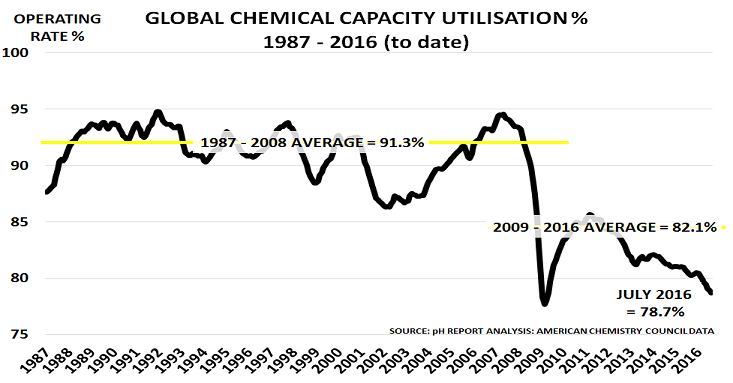 If this proves accurate, and oil prices keep tumbling, then we may have a busy month ahead.